NEW YORK – Roy Rydell, a member of the People’s Weekly World editorial board, died here Nov. 20. He would have been 83 on Feb. 15. He was a charter member of the National Maritime Union (NMU) and a life-long member of the Communist Party. He is survived by his wife, Lillian, and stepdaughter, Judy Finn. Roy’s love of the sea and the ships that ply the oceans began while watching and listening to waves of the Atlantic Ocean lap the rocky beaches of Far Rockaway in Queens, New York City. Peter “Pete” Goodman, president of the Marine Workers Historical Association, who, like Rydell, had been “screened” off the ships, said he was stunned when he learned of Rydell’s death. When Rydell and a couple of dozen other “screenos” decided to take the Coast Guard to court, Goodman, a member of the Marine Firemen’s Union, became executive secretary of the Screened Seamen’s Defense Committee. “It took five years but we finally won our case against the government. We thought that settled things, but we were wrong,” Goodman said. Sam Webb, national chair of the Communist Party, described Rydell as the model of what a Communist should be. For Rydell, no task was too small or challenge too great. “He gave his all, no matter what,” Webb said. “Now our challenge is to fill the gap left by his departure.” Webb said a memorial is planned for February. Joseph Stack and Julius Margolin, both of whom sailed with Rydell on the SS America and both of whom were screened, described him as a “sailor’s sailor” who knew his business. They said Rydell was respected by everyone, including the most rabid anti-communists in the union. “He never shirked when there was work to be done,” Margolin said, adding that one of the jokes around the union hall was that if his ship was in port for a week, Rydell would paint it from stem to stern all by himself. 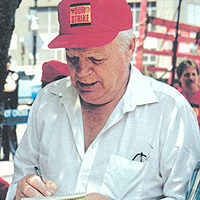 Joe Crimi, vice president of International Longshoremen’s Association Local 1814, described Rydell as a “tough old bird, one of the best union guys I ever met.” Rydell’s coverage of the local’s struggle against Domino Sugar and his work to gather support for the striking workers was much appreciated. Although Rydell was reluctant to talk about himself, I was able to glean information about his life during brief discussions over the course of a decade: his father was a salesman and his mother a homemaker; he was a better-than-average high school athlete and the neighborhood handball champion; as a member of the Young Communist League club in his high school, he helped lead a successful boycott of the school cafeteria when the price of a serving of mashed potatoes was increased from two to three cents. He always took a suitcase full of Party literature when he signed on for a new trip. Despite the anti-communism and red-baiting within the union, he was often elected a delegate to NMU conventions. He last ran for union office in the late 1980s, nearly winning election as port agent in New York. In 1987 Rydell decided he’d “been there, done that” and walked down a ship’s gangplank for the last time. “They were going to lay the ship up so he decided to hang it up,” Lillian remembers. But for Rydell “retirement” meant that he had more time to pursue the important things in life: going to demonstrations, distributing the People’s Weekly World at Central Labor Council meetings and honing his skills as a writer, with stories about the Domino strike, the Charleston Five and demonstrations large and small. It meant revitalizing the labor commission of the Party’s New York District, helping to organize May Day demonstrations, visiting picket lines and union offices. And yes, it meant being honored at the People’s Weekly World Annual Awards Banquet in 1998. Carolyn Rummel, managing editor of the World, who worked with Roy in getting his stories – always hand-written on yellow legal-sized paper – ready for publication, described him as the epitome of a working-class writer. The family has asked that donations in Roy’s memory be made to the People’s Weekly World.